In November, CCP rolls out its Alpha and Omega clone state mechanic that will allow people to play EVE with a clone with limited abilities forever. Everyone has opinions and they share them constantly. The forums, Reddit, podcasts, news sites, and bloggers. But the one group we never think of is the characters in the game itself? What would one have to say about the current situation? What follows are the thoughts of Rosewalker, a mystic from the Vherokior tribe residing in the Minmatar Republic. Rosewalker is a graduate of the Republic Military School in YC111 (2009), who then did advanced coursework in EVE University. After serving a short stint in factional warfare, he joined the family business run by his sister. In YC117 he joined Signal Cartel, where he spent 17 months before returning to the family business. Control. Everyone wants control. The only problem is, most of the people who want control should never have it. Sometimes, those people watch the control slip from their hands. I don't know what the Jovians intended when they allowed the empires access to cloning technology. Genolution is only a memory now, but the now departed puppetmasters used that corporation to dispense technology throughout New Eden. Perhaps the Battle of Vak'Atioth led to the decision to ensure none of the other human empires could ever gain enough power over the other empires to then turn their attention to the numerically inferior Jove. I can't complain; the defeat gave my people the opening to rebel and forge a republic that a quarter of Matari now call home. I wonder if the rulers of the great empires thought they could control the empyreans. If so, they were sadly mistaken. Large numbers of us may live within their boundaries, but they control us about as much as the Amarr now control Heimatar, Metropolis, and Molden Heath. The Amarr, however, seek to control the universe under their religious doctrine called the Reclaiming. If the Amarr want to fulfill God's plan, they must keep all people perpetually beneath them. The empyreans, by their mere existence, made a mockery of their God. The capsuleers, as empyreans are commonly called, are only kept in check by the Jovian technology granted to CONCORD and the capsuleers' willingness to put up with the rules of the four empires. Sometimes, the empires are reminded of the chaos capsuleers can cause. Never underestimate the bloody-minded determination of the religious fanatics that run the Amarr Empire, though. Just as their scientists developed vitoc to control the slave population within the Empire, they continue to seek new clone technology. In YC113, the Amarr developed technology that allowed for clones to transfer their consciousness upon death without capsule technology. Their quest for immortal slave soldiers who would die thousands of deaths, however, became known and then copied. While such a result kept the Jovian goal of a balance of power among the empires intact, that just meant an increase in the number of super soldiers. Perhaps New Eden is fortunate that the concept of the clone soldiers didn't prove more popular. In a bit of poetic justice, the Drifters gained vengeance on the Amarr Empire for developing the new technology from their bodies by alpha'ing the Avatar of Empress Jamyl I and then podding her in the system of Safizon in YC117. I can't say I shed a tear over the loss of the empress. "Today, together, we stand firm at the beginning of a new path. A path that takes us on a journey paved with prosperity for loyal subjects of the faith. "A journey, the first fleeting steps of which we take today, that marks a turning point for this great Empire and sets us on a course to stability, security and opportunity. "To ensure an end to the atrocities we have borne witness to and experienced at the hands of those who would defy the word of God. "However, with great military power comes great responsibility. The might and the honor of the Imperial Armed Forces will be restored, and with it we will usher in a new generation of capsuleers to support the Golden Fleet. "Tens of thousands more capsuleers will graduate from the Imperial Academy to join our already established and prized loyalist forces, in the largest expansion to our pod pilot training program ever conceived." An expansionist Amarr Empire is never a good thing for the Minmatar. Rumors coming out of the Empire suggest these new capsuleers are somehow different. Given the history of Amarrian efforts combined with their religion, I expect that these new recruits will not have the full power available to the normal empyrean. Also given the history of Amarrian scientific efforts, I expect the other empires to quickly copy the technology and create capsuleer forces loyal to themselves. I find the idea of a crippled form of capsuleer repugnant in the extreme. If the empires' scientists can create a crippled form of capsuleer, can they also modify existing capsuleers to make them more controllable? Are all of us capsuleers at risk of succumbing to the desires of the empires? If so, does that mean we can rescue these new capsuleers and turn them into true empyreans? If for no other purpose than to thwart the will of the new empress, I sincerely hope so. What Faction For An Alpha Clone? If I wind up creating an Alpha clone account in EVE, the first decision I need to make is which of New Eden's four factions to choose. When I began playing EVE in 2009, a player's faction and bloodline mattered due to the starting attributes each gained. As time went on, CCP decided New Eden had too many Caldari Achura running around and standardized the learning attributes across all factions. With that one move, a player's choice of starting faction really didn't matter, at least mechanically. I spent the weekend getting a lot done in EVE Online. On Saturday, I ran the Sisters of EVE level 1 epic arc in two long play sessions. In EVE, actions have consequences, and I needed to perform penance after the standings-wrecking grind I did to obtain a Nestor blueprint copy. The 16 million ISK in mission rewards is nice, but the 8.75% improvement in Rosewalker's Amarr standings is the real draw. I started the day with -4.97 modified standings (-8.71 unmodified) and wound up at -3.66 (-7.08 unmodified). 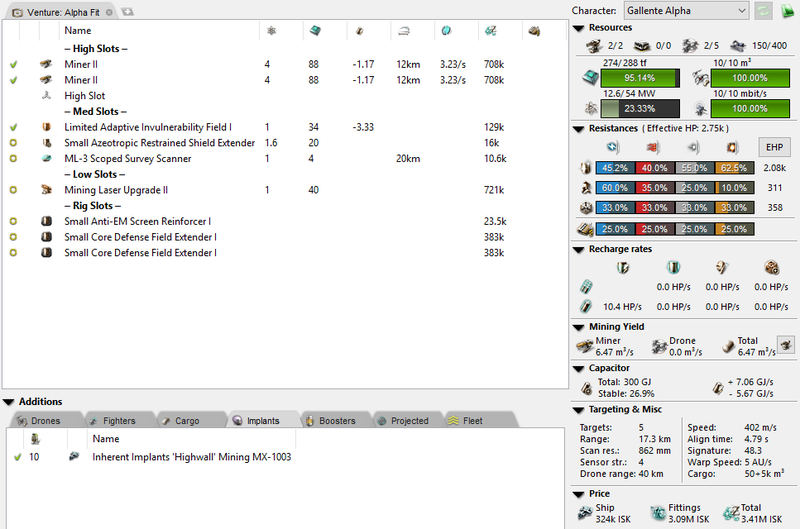 The 50-mission arc took less than 5000 rounds fired from the autocannon mounted on my Vagabond. When I finally got back to my high sec base, I found eight Purity of the Throne sites practically sitting off the undock. What better way to get the bad taste of getting the Amarr to like me more than to shoot up over 100 Amarr ships? Needless to say, I wound up running all eight sites. The best skin that dropped was for the Amarr supercarrier, the Aeon. The sites only took a few minutes each. Yesterday I had one mission: mining. I travelled to a 0.7 system because I need isogen and stripped down an asteroid belt. Since I had never visited the system before, I sent Wandering Rose ahead to scout out the belts and create bookmarks in a Jaguar. The Jaguar fit I use is a nice little PvE setup that relies on signature tanking. The ship didn't have the DPS to break the tanks of the Angel Cartel battleships in the Shadow of the Serpent event, but handles everything else just fine. On the way back from the asteroid belts to swap over to a Skiff, I ran across a Purity site. The Minmatar assault frigate performed as expected and an Apostle SKIN dropped. A pretty nice way to start the day. After mining, I ran a few more Purity sites in my Jaguar. I could have switched to the Vagabond, but bringing in a heavy assault cruiser felt like complete overkill. Yes, in EVE overkill is usually considered a good thing. But I wanted a little challenge. Okay, running the Purity sites in a Jaguar wasn't a challenge. Just like running the Sisters of EVE arc in a Vagabond was not a challenge. The closest I came to a challenge running the Purity sites is when I used an Arbitrator. Even then, I don't know if the challenge was due to using a bad ship or just one totally opposite the type I usually fly. I think the content for the mini-event was tuned to characters with a lot less than 150 million skill points. I had a strange thought at the end of Saturday night. What if I had a new character? Then the now easy content would provide a challenge again. Up until now, that was just a wish. Technically, I could make one, but I never wanted to make a new character enough to stop training on one of my existing characters. 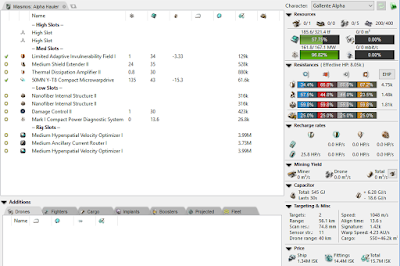 Also, buying skill points was out, as I don't want to grind ISK just to advance a character. If I want to play a game where I advance skills based on the amount of time I play, I'll start up Star Wars: The Old Republic or Guild Wars 2 again. I think I might have started an alpha account anyway because of the blog. After this weekend, though, I kind of want to start a new character just to run some of the content I outgrew years ago. So now I have to think about exactly what I want from my alpha clone. 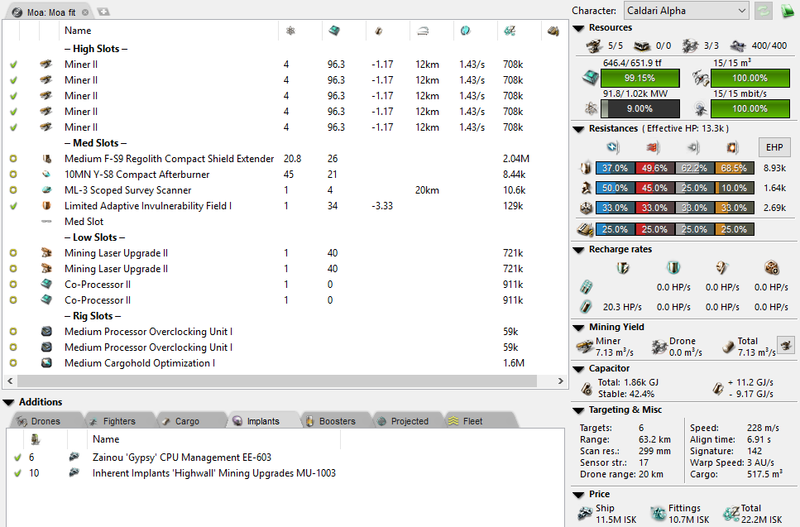 And perhaps more importantly, I need to finish up mining the rest of the minerals to build my Nestor. "The Alpha Clone State is the new base state for all clones and it will be available to any character in New Eden at any time. Clones in the Alpha state will be able to train and use a specific set of skills including tech one Frigates, Destroyers and Cruisers for your faction along with essential weapons and modules. Alphas will also train skills at a reduced rate compared to Omegas." One of the fascinating parts of the new clone states in EVE Online is the statement that Alpha clones (i.e. non-subbed players) will train skills at a slower rate than players who pay a subscription. But how, exactly, will CCP accomplish the goal? I think CCP will do something radical. 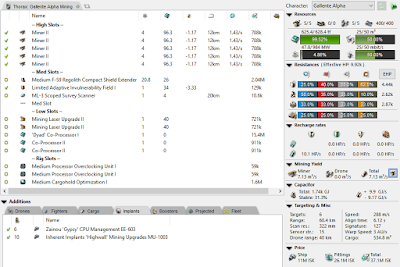 The skill set for Alpha clones includes Cybernetics III, which allows the use of +3 learning implants. Does not allowing Alpha players to not use +4 or +5 learning implants make that much of a difference? 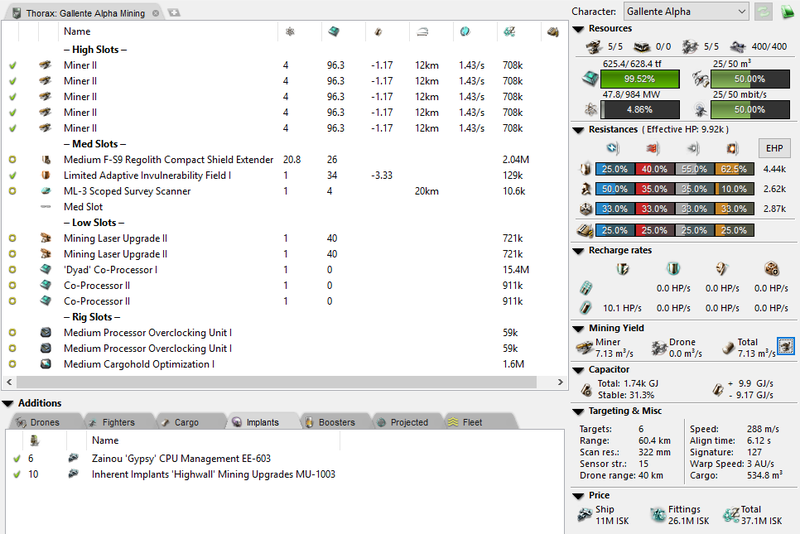 I could see CCP not allowing Alpha players to remap attributes. One of the problems with the current system is that new players get 2 neural remaps and sometimes get themselves into trouble. Still, does limiting alpha clones to +3 learning implants and no remaps really reduce the rate Alpha players learn skill points compared to subscription players? I don't think so. If neural remaps get new players into trouble, then why not go all the way and just remove learning attributes completely? That way, Omega players can have one set training rate while Alpha players train much slower. For those who want to train faster, CCP could sell cerebral accelerators in the cash shop. Experience point boosters are very popular in MMORPG cash shops. Up until now CCP has limited the availability of the cerebral accelerator to new accounts and to rewards in live events. The introduction of skill point injectors boosted CCP's bottom line in February. Selling the skill point boosting cerebral accelerator would result in another financial bonanza. Removing the learning attributes would leave CCP with a major problem. What about all the implants already in use? 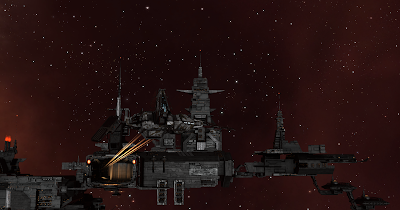 Unless the plan is great, more than half of EVE players would probably start shooting monuments in Jita. Does CCP want to risk that? I don't think so. So what is CCP's plan to make sure Alpha clones train slower than the Omega clones? Maybe we'll find out at EVE Vegas. I'm really curious to find out, but I don't need to know right away. I still wonder if I should sell my replacement implants now, though. How Much Mining Do I Need To Do? Sometimes I have moments in EVE when I say to myself, "You're kidding!" Sunday was one of those times. I spent the morning mining in high sec while listening to Wiggles EVE Radio talk show and then his music show afterwards. After three hours or so, my two Skiff pilots with Rosewalker providing boosts in an Orca cleaned out an asteroid belt in a Minmatar 0.8 system. All 414,997.2 m3 of ore in the belt. Don't hate me for mining so much. 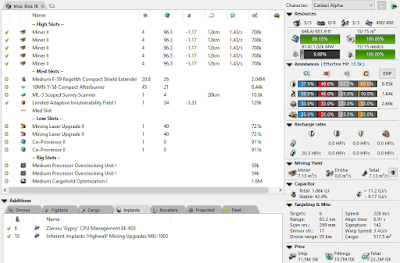 I know I can make much more than the estimated 69 million ISK the UI tells me I made over the time. The purpose of my quest is to grind all the loyalty points and mine all the ore required to build a Nestor. I wanted to see if I could learn anything. 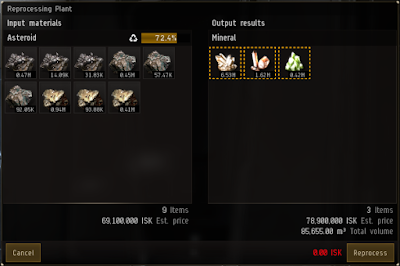 First, reprocessing the ore in a station earns an extra 14% than just selling the ore on the market. I should add I have max reprocessing skills, including a 4% reprocessing implant, plus over 6.67 standings with the NPC corporation that owns the station. 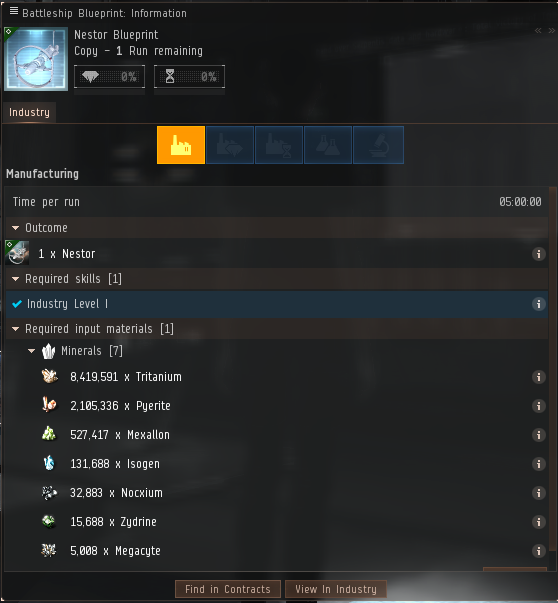 The big surprise, and what had me talking to myself, is when I compared the output of my mining session against my Nestor blueprint. I mined out an entire belt and still fell short 1.9 million tritanium, 500 thousand pyerite, and 100 thousand mexallon for building a Nestor. I did not realize just how big a battleship is until that moment. 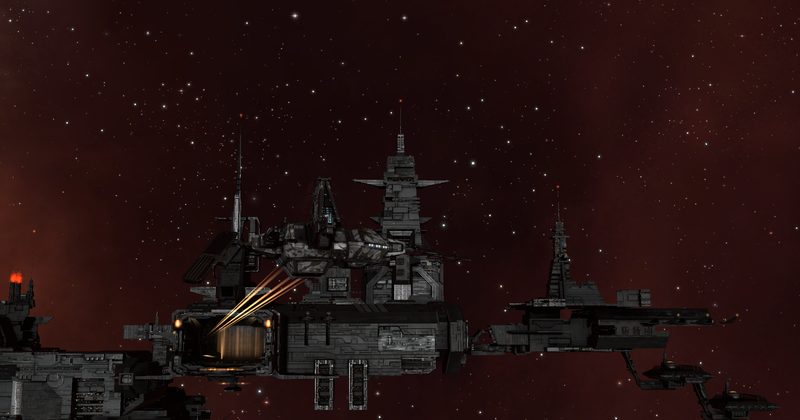 I guess the presence of titans in the game skewed my perception of what big is in EVE. I began playing after the introduction of supercapital ships in New Eden. In my defense, a titan is huge and something one doesn't forget. Compared to an Avatar, a battleship is small. But anything that requires mining over 600 thousand cubic meters of asteroids is not tiny. Then again, the volume of the Great Pyramid of Giza is 2.5 million cubic meters. The ancient Egyptians really knew how to move rocks around. I'm getting close to finally building the Nestor. Accomplishing a goal always leaves a good feeling. Now, I just need to start mining in low sec to get the rest of the minerals. Friday's charging of Craig Douglas and Dylan Rigby in the U.K. for operating an illegal gambling site based on FIFA 16 leads to the obvious question: how will this affect EVE Online? Specifically, does the U.K. Gambling Commission consider EVE Online gambling sites as operations required to obtain a license from the UKGC? I wrote about the CS:GO gambling scandals back in July. Since then I just watch for news on the class-action lawsuits filed in Florida and Connecticut. The only real update occurred in August with the filing of a third class-action lawsuit in Washington state. Despite some rumblings about FTC involvement in the situation, the legal action in the United States is confined to civil court. A second front with different rules opened up Friday with the arrest of Craig Douglas and Dylan Rigby, both from Essex, in the UK. According to the gambling news site CalvinAyre.com, the UK Gambling Commission (UKGC) charged the pair with promoting a lottery, advertising unlawful gambling, and inciting individuals to gamble. In August, the UKGC sent cease-and-desist letters to over 100 gambling sites operating without a UKGC license, with most owners complying with the order. I think I found the video that the UKGC will use as exhibit A in their case. Douglas, better known as Nepenthez on YouTube, published a video hawking a site called FutGalaxy. If the formatting holds, you can see the segment I think is most damning. If not, the segment in question runs from 3:10 to 3:24. "The best part about this site is the sports bet section. So if you guys are into betting -- and you don't have to be eighteen for this because it's a virtual currency -- this is the place for you." A domain lookup on ICANN shows the registrant contact for the website is Dylan Rigby. Turner Sports eSports commentator Richard Lewis linked the two as business partners in the company Game Gold Tradings Limited in a video uploaded to YouTube yesterday. In the video, Douglas recommends using FIFA Comfort Trade for cashing out of his site. FIFA Comfort Trade works with three illicit RMT companies in doing the transfers. The user is asked to give one of the illicit RMT companies his account login information and then the company deposits the funds into the user's account. Quite frankly, not recommended behavior. 3.4 We are also paying close attention to the growing popularity of other forms of virtual currencies or ‘in-game’ items, which can be won, traded, sold or used as virtual currency to gamble with and converted into money or money’s worth. These include digital commodities (such as ‘skins’) which can be won or purchased within the confines of computer games and can then be used as a form of virtual currency on a growing number of gambling websites. 3.5 We recognise that the term ‘skin’ can mean different things in different games. In the context of this paper we are referring to in-game items that provide aesthetic upgrades to a player’s game play where those in-game items can also be traded as commodities on a marketplace within a platform operated by the game’s developer or distributer. In some cases, the inventory of the player’s account can be connected to websites where the user can use the ‘skins’ they have bought or won to bet or stake in casino style games. These types of ‘skins’ have a monetary value derived from the current market price and can be converted into money. 3.6 Where ‘skins’ are traded or are tradeable and can therefore act as a de facto virtual currency and facilities for gambling with those items are being offered, we consider that a licence is required. Can they be converted to money via third parties? Are they tradeable with others to obtain goods or services? Can they be used as virtual currencies to pay for goods or services? If the answer to one or more is yes, then the prizes or winnings is money's worth. Watching the video, Douglas and Rigby fell afoul of the money's worth criteria for determining if an activity falls under the jurisdiction of the UKGC. Back in July, the scandals involving Counter Strike: Global Operations gambling sites and the resulting class-action lawsuits initially only targets the big pockets of Valve. Friday's news was the first sign of governments stepping into the area. Governments, unlike private litigation lawyers, usually don't care about the size of the settlement. Gambling site operators need to exercise a lot more discretion and/or care about following the law in the future. Last night I did a little prep work for doing some mining this weekend. I made some tech 1 mining crystals as ingredients for the tech 2 crystals I also made. Then I flew into low sec, picked them up along with some EMP S & EMP M ammunition and flew back out to my high sec mining base. I had a little time left and some event sites were up in the system again. 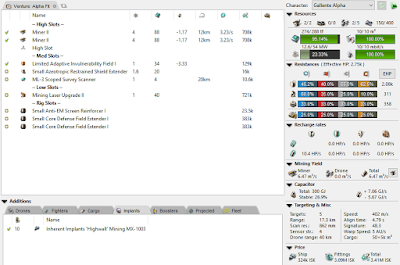 So I put Wandering Rose in a Vagabond and let her start killing Amarr heretics. Flying a heavy assault cruiser was probably unfair, but I just wanted to kill NPCs as quickly as possible so I could get some sleep. That's right, a capital SKIN dropped in high sec. I should add that although I fly an Arbitrator, I hate the way the Purity SKIN looks. Never mind any high-minded role play reasons, I don't find the SKIN aesthetically pleasing. I don't know why I keep running the sites. I don't think the SKINs will make me that much money. I guess the collector in me just wants to catch them all. Last night I didn't have much time to play EVE, so after setting up production of some mining crystals, I hopped in an Arbitrator and decided to run some of the event sites. I know, the Arbitrator is Amarr tech 1 electronics warfare cruiser. But the ship is a nice drone boat and I use it to practice armor tanking. I had two sites sitting outside my station, so I didn't have very far to go. The sites themselves are pretty simple and designed for newer players to participate. I think tech 1 cruiser piloted by a low skill point pilot should find the sites challenging but doable. The waves are mostly just frigates and cruisers, and the frigates don't try to tackle you. I wound up keeping my ship at range and letting my drones do most of the work. The prize for running the event site is a ship SKIN that drops from the battlecruiser that appears in the final wave. The Arbitrator has two utility highs and my fit has a small tractor beam in one of the slots. The tractor beam comes in handy to get to the wreck faster. Since the rest of the post repeatedly refers to SKINs, I thought I'd embed a video from CCP's support site that explains just what a SKIN is and how it works. The event takes its name after a group known as "Purity of the Throne", who don't believe the new Empress is pure enough to take the throne. But they drop SKINs for almost all of the Amarrian ships, so they're good for something besides target practice. I wound up getting the SKINs for a Inquisitor logistics frigate, a Vengenance assault frigate, and a Damnation command ship. I actually received the Damnation SKIN from the first site. I don't fly Amarr ships, but I do want to pick up a Damnation in the near future. While flying a white Damnation in formation with a Nestor battleship sounds good in theory, the idea has one flaw. Both of my main pilots are Vherokior, which helps explain why I don't mind the low standings that comes with shooting Amarr Navy ships. The only reason I worry about my Amarr standings at all is that I do need to do business, however distasteful, in the Empire. Sorry, but the idea of flying around with markings identifying myself as a member of a radical offshoot of the Amarr is, to put it bluntly, distasteful. Worse, some sick individuals, probably on the Theology Council, figured killing the dissidents and wearing their SKINs to support the ascension of Catiz I to the Amarrian throne is a good idea. I definitely do not want to support the new empress. About the only good thing I can see coming out of the idea is that Purity of the Throne ships will have the perfect cover to sneak in and assassinate the new empress. Of course, that assumes a level of competence I don't think we'll find among the rebels. I don't want anyone to think I don't just dislike SKINs for Amarr ships. I don't want to fly with any SKINs whose lore conflicts with my characters' beliefs. For example, take the Valklear SKINs. A perfectly fine-looking paint job that will give ships a similar look to the base ORE paint scheme. But the Valklear isn't just the name of a painter. "Valklear commanders rely wholly on specialized recruiters to fill their ranks. They tour the courtrooms and judgement halls of the tribes, and with a trained eye they pick out the prime cuts of criminality from the great swathe of vicious, vile, and corrupt. Once the recruiter has selected a candidate, he works on bringing the convict into the system. Each recruiter has his own persuasive technique, but for many hard convicts, presented with the option of a lifetime behind bars or a shorter term in the military, the choice is a rather obvious one. "The recruiter’s selection is not as clear-cut as one may think, though. They recruit from a broad range of the criminal fraternity. One day, a violent psychopath may be paid a visit, the next a serial killer, and then perhaps a corrupt lawyer, a notorious embezzler – even people who may have never held a weapon in their lives. The path the criminal has taken matters less than their skills, instincts and the inherent potential the recruiter perceives." Sorry, but I want no part of the Valklear. 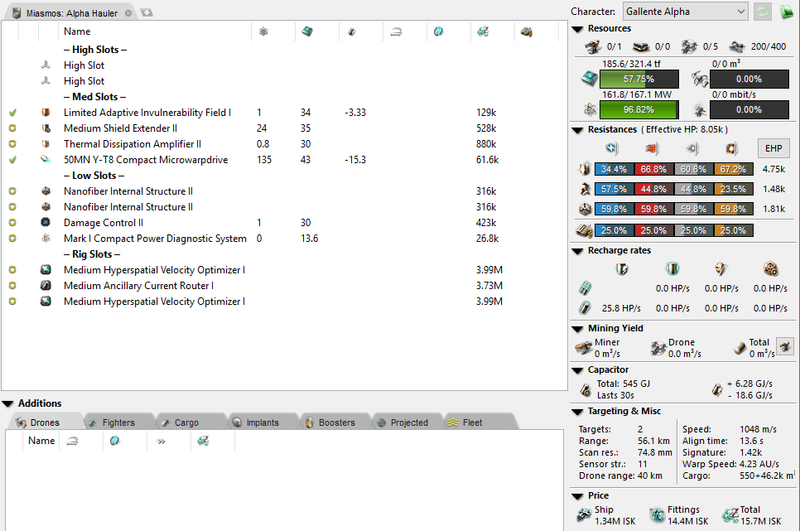 I'm a relatively peaceful capsuleer. Having a connection to that group is bad for business. The group is so notorious that the members receive a cover identity if they survive their term of service. No thanks, I'm not picking up any Valklear SKINs. Immersion, in some circles, is a dirty word. Before I buy a SKIN, I do my research into the lore to see if my characters wouldn't object for some reason. So I won't buy a lot of the SKINs on the market. To tell the truth, I haven't bought any SKINs up until now. And even though don't have to spend real life money to acquire a Purity of the Throne SKIN and own them, I'm not going to inject them. I might wind up selling them, but flying with them displayed on my ship? I have standards. I logged into EVE last night, but didn't do much. The new event presaging the coronation of Empress Catiz I doesn't sound too interesting. The rewards, unsurprisingly, are directed at Amarr players, or at least Amarr ships. I plan to go into more detail in another post, but I do not want that skin on any ship I own. The big change for me is the addition of a second mining turret on the Procurer hull. Guess who didn't go out and pre-purchase extra Modulated Strip Miner IIs? That's right, I didn't. When I looked on the market in Heimatar, Rens only had one. I wound up travelling to Molden Heath. I only bought four more, which leaves me a bit short since I have twice as many Procurers and Skiffs. I'll wait until the price drops to pick up the rest of the equipment I need. I also needed to make more mining crystals. I put some Veldspar Mining Crystal IIs in the hopper and started researching some Scordite Mining Crystal II blueprint copies. I'm good on the rest of the crystals for now, but I need to take stock of what I have before proceeding. I may even need to pick up some more datacores from my far-flung network of research agents. Finally, I saw that the art department modified the Probe hull. Considering how much time I spend in a Cheetah, I was a little hesitant to look. I am not a big fan. My first reaction was, "What happened to the dorsal fin?" The Probe had a big solar collector sticking up out of the top of the ship. Kind of like a shark. Okay, the new model is less angular and probably more stealthy, but I really liked the distinctive fin sticking out of the top. I realize that Minmatar technology improves at a rapid rate, but I liked the aesthetics of the old ships. We have two months until the expansion hits in November. I need to use the time wisely and take advantage of the current fleet bonuses while I can. I still have a quest for a battleship to fulfill. Between feeling a bit under the weather and working late last night, I don't really have a post today. Some significant WoW-related news hit with Blizzard's Chris Metzen announcing his retirement from the gaming industry after 23 years at the company. As one WoW figure leaves the scene, another one returns. Rob Pardo, the former lead designer of World of Warcraft, has formed a new studio, Bonfire Studios. Pardo's new studio has already received $25 million USD in funding from Silicon Valley venture capital firm Andreessen Horowitz and from Riot Games, the makers of League of Legends. On the learning front, apparently playing video games can benefit children. Now, before going out and buying GTA 5 for the kids, read the research. First, a researcher in Spain found that one hour of gaming per week led to stronger motor skills and higher achievement scores. Two hours didn't lead to further improvement and nine hours led to conduct problems, peer conflicts, and reduced social abilities. The other item is that a Yale researcher has developed a set of computer games that improved the academic performance of inner-city students even more than if the students received one-on-one tutoring. The training, conducted three times a week for four months, led to students improving in more than just playing video games. "'The program increases focus, self-control, and memory — cognitive skills essential for learning,' said Dr. Bruce Wexler, professor emeritus of psychiatry at Yale and lead author of the study. 'And these are the exactly the cognitive skills affected by poverty, so we believe brain training programs like Activate can help reduce the achievement gaps related to poverty that are seen in schools across the country.'" "As the coronation of Empress Catiz I draws closer, there are those who consider her ascension to the Golden Throne of Holy Amarr both unjust and improper, based on archaic views that call the purity of her Udorian heritage into question. "With the might of the Imperial Armed Forces at her heel, and both the Ministry of Internal Order and Theology Council ratifying the views of the Purity of the Throne movement as heretical, bounties have been placed on the heads of their members. "The Empire is encouraging capsuleers across the cluster to strip the heretics of their colors, and wear them in support of the ascension of Catiz I to her rightful place as the leader of the Amarr Empire." The lore behind the Amarr is fascinating. Hopefully I'll have time to explore the stories in a lot more depth than by just reading The Empyrean Age. That's a quick spin around the gaming world. Hopefully I can dig into the patch tonight and give some impressions of the new artwork and live event on Tranquility tomorrow. I was a bad blogger this weekend. 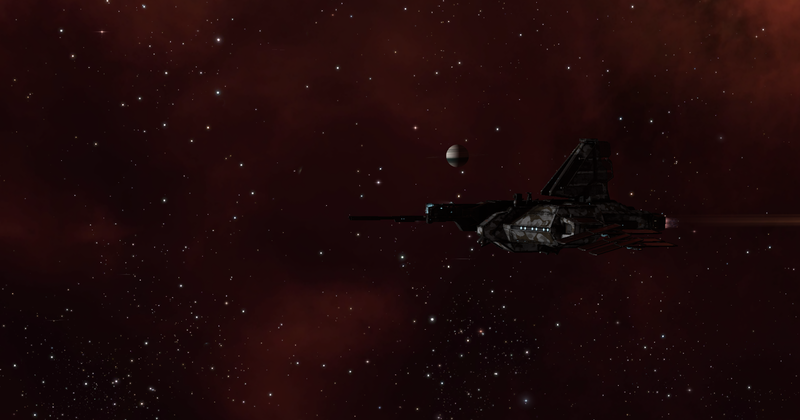 Instead of writing a super-duper cool post, I spent the weekend playing EVE. So with the mining update going live tomorrow, I have an update on my quest for the great white battleship. 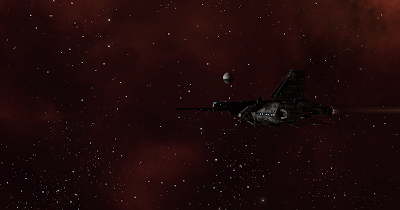 On Saturday, I met my 600,000 Sisters of EVE loyalty point goal and spent the 150 million ISK to get a Nestor blueprint copy. Now, all I have to do is acquire the minerals to build the damn thing. All right, if I don't already have all the minerals sitting in my hanger already, I'm only a little bit short on tritanium. But using minerals I've already mined breaks the rules I set up on my little quest to build a Nestor. Just as I didn't use any of the 348,000 loyalty points I had already acquired to buy the BPC, I plan on mining all of the ore starting either tonight or after the patch goes live on Tuesday. The major casualty of the grind was Rosewalker's standings with the Amarr. I forgot to record his starting standings, but by the end, his unmodified standings stood at -9.03. Diplomacy improved the total up to -5.22, but that still put him on the Amarr Navy's shoot-on-sight list. On Sunday, Rosewalker took a Prowler to Oremmulf and started running missions for three level 1 distribution agents for Imperial Armaments. I thought distribution missions were the fastest way to improve Rosewalker's Amarr standings. He needed to run storyline missions in order to improve his faction standings. The only problem was that the game only gives out a storyline mission for every 16 regular level 1 mission run with a faction. Worse, I had to decline any storyline mission involving shooting Minmatar faction ships, as I did not want to drop my Minmatar standings any more than necessary. One disconcerting fact I encountered is that level 1 distribution agents do not always hand out distribution missions. They even hand out mining missions. I discovered that a Procurer, even one flown with Rosewalker's sub-par skills, made extremely short work of those. For the level 1 combat missions, I pulled out an old sniper fit for a Breacher. A 54 km range with tech 2 light missile launchers made short work of the NPCs. I'm beginning to wonder if mining missions would work better, assuming the grinding pilot can fly a Procurer decently. If none of the missions requires more than 2000 m3 of ore mined, that's less than one Strip Miner I cycle. The missions could take even less time to run once Procurer hulls receive two turrets on Tuesday. I may need to conduct an experiment to find out. I wound up running three of the four storyline missions I triggered because one was a combat mission. The two courier missions granted me a 0.09 point gain in my unmodified standings and the Materials for War mining mission gave me a 0.14 point gain. The 0.32 gain translated to a 0.25 modified standings gain, raising my standings from -5.22 to -4.97. The Amarr Navy will grumble as I traverse their space, but I made my standings goal. As I mentioned before, the next step is to acquire the minerals needed to build the Nestor. While the bulk of the mining will occur in high sec, I still need to travel to my mining caches in low sec to get some of the rarer ore. I may even take a trip to null sec to get the needed megacyte, as mining in null is safer than mining in ore sites in low sec. But for now, I am right on schedule to build the great white battleship. Just a quick post about subscriptions in MMORPGs. As players, we trained the game companies well. Back at the beginning of the century, the monthly subscription became standardized at $14.95 per month. Some games charge less, but I am unaware of any game that charges more. Eventually, the game companies need more money to keep up with inflation. 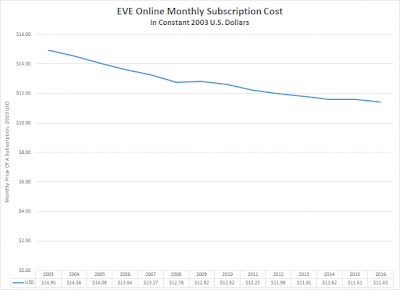 The above graph shows the amount that players pay for a monthly subscription in EVE Online. Over the course of the past 13 years, the value of the monthly subscription CCP collects has fallen 23.5% in constant 2003 U.S. dollars. 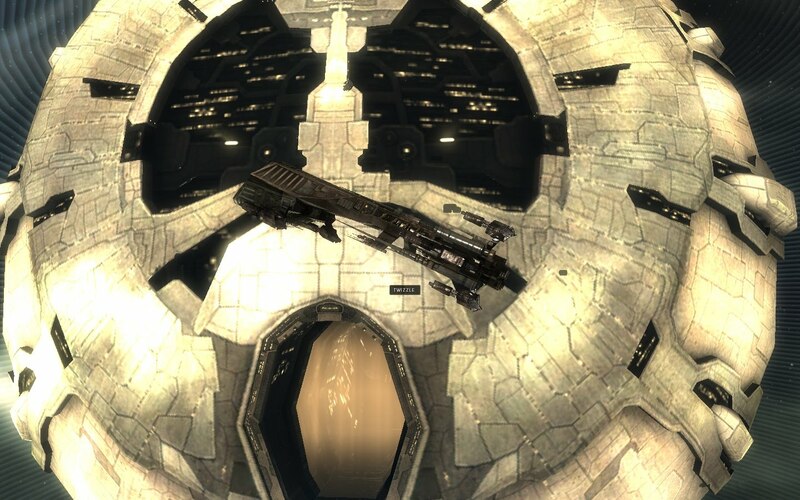 While the subscriptions rose, CCP could shrug off the decline. But despite an amazing 10-year run of rising subscription numbers, the inevitable happened and the numbers started to drop in 2014. 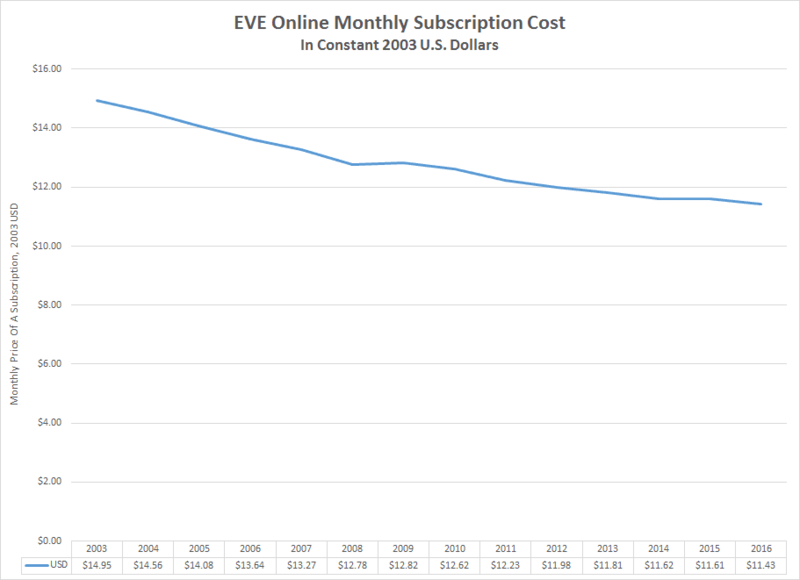 A lot of people say that EVE is dying and a move to any type of free-to-play or freemium option is proof. The answer is simpler. The value of the subscription falls every year and CCP is looking to replace the lost revenue. The amount of the subscription is capped. The prices for virtual items, on the other hand, are not. Guess which direction CCP is moving. I don't think the answer should surprise anyone. I have the feeling that come November we will see a lot of min/maxers roll up a lot of Gallente Alpha clone characters. I know that the drone meta is pretty popular, but the Gallente are so flexible right now. Not only can the Gallente mission effectively, but in my opinion, they offer the best option for those interested in mining as well. I would wager that most people think that the best mining ship available to alpha clone players is the Venture. A good guess, as the example fit below shows. The fit, including the +3% mining implant, has a mining yield of 388 m3/minute and will fill up the 5,000 m3 ore hold in a little under 13 minutes. Notice I fit a survey scanner in order to pick out big rocks to target, which allows for a little AFK mining play. Also, I did not fit mining drones because alpha clones can't use them. But the Venture does not offer the best yield to an alpha pilot. That honor is shared by the Moa and the Thorax. Of the two, I prefer the Gallente option. Both the Thorax and Moa have a yield of 428 m3/minute, 10.3% greater than the Venture. The Moa actually fits a better tank and doesn't require a faction co-processor to squeeze in the fit. I can even fit a prop mod for greater mobility. So why choose the Thorax? Because Gallente pilots have much better drone skills than Caldari pilots. A big difference is that Gallente pilots can field flights of 5 drones while Caldari pilots can only field flights of 3. Besides the number of drones, the Gallente alpha pilot has much better drone support skills. For example, a Gallente alpha pilot flying the Venture fit above has the same DPS as a Caldari alpha pilot flying the Moa. In the fits above, the max skilled Gallente alpha pilot does 62 DPS in the Thorax while the max skilled Caldari pilot only does 25 DPS in the Moa. Given the toughness of the high sec belt rats, I'd rather have the 62 DPS and kill off the belt rats much faster. The second reason I prefer the Gallente is the presence of multiple industrial ships. In the case of mining operations, the Miasmos is the ship miners will desire. For those who only shoot at industrials, the Miasmos is the ship that specializes in moving around ice, gas, and most importantly for alpha players, ore. The 46,200 m3 ore bay can easily carry the mining output of one Thorax for 1 hour and 45 minutes. That 46,200 m3 is also the largest amount of ore any ship an alpha clone can fly can transport. I need to add one very important fact about the Thorax and Moa mining fits. The cargo hold is small, only holding approximately one minute's output. To continuously mine, the player will need to deposit the ore into either a jet can or and anchored secure cargo container in a 0.8 or less security system. Those who want to relax and watch a movie or surf the net probably will prefer mining in a Venture. I guess I should add that people won't see me flying any of the above fits on my paid accounts. This afternoon I will finish the last skill to gain mastery 5 for all the mining barges and exhumers. Trust me, when I'm flying a Skiff with mining drones deployed, I mine 1,338 m3/minute, or almost 4 times the amount a max-skilled alpha pilot pulls in a Venture. I possibly am wrong, but I don't fear the flocks of free alt accounts stipping down asteroid belts in high sec. I lived that with bots back when I first started playing EVE and I don't think the botters will bother with Ventures unless CCP bans out their bot farms. Yesterday marked the end of my first month of grinding for a Nestor. That's right, one calendar month and I am not finished earning the loyalty points needed to purchase the blueprint. Okay, I have the Sisters of EVE loyalty points now, but I want to grind 600,000 and not use any of the 348,000 I started with. Over the course of the past month I collected 537 thousand LP. Not bad considering I only ran missions for 20 of those days. I also wanted to earn enough ISK to purchase a armor tanking command ship. My first choice was a Damnation, but I will need to reevaluate the choice based on the final outcome of the fleet boosting changes. I assume the command ships will also receive a balance pass, so I need to hold off on buying a new ship. I don't have to worry about money when I do go shopping. 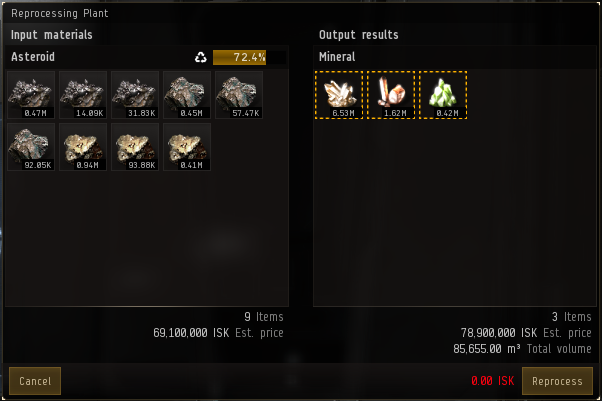 Over the course of the last month, my wallet is over 500 million ISK heavier and the price estimator in the station tells me I collected over 1.2 billion ISK in loot and salvage. And for regular readers who know I manufacture my own ammunition, the inventory figure does take into account my mineral consumption. During the run, I managed to get Rosewalker's standings with Amarr under -5.0, which means I'll need to find a nice level 1 distribution agent to do missions for to grind standings back up. I'm actually curious as to how hard getting back to -4.9 is, so the standings drop is a feature, not a bug. Of course, Wandering Rose has only dropped from -2.3 to -3.5, so I can still run the Sisters' epic arc without having to do any prep work like I do for Rosewalker. My timetable for finishing my self-created quest to obtain the Nestor is running just about according to schedule. I want to finish the grind to 600 thousand skill points by next Tuesday when the mining ship changes hit Tranquility. After that, I have approximately two months to mine with the current fleet boosts and two turrets on my Procurers and Skiffs. Depending on how the mining goes, I may try to build a Tempest Fleet Issue as well as a Nestor. I do want to add I am so ready for the LP grind to end. I need to learn how to do the burner missions, as they would add variety to the grind. Also, I didn't start getting missions against the Angel Cartel like Worlds Collide and Angel Extravaganza until this past Sunday and Monday. Was I just unlucky? I expected more Angel Cartel missions due to operating in Metropolis. Instead, I think I've received more Serpentis missions, although I've killed more than my fair share of Amarr Navy ships during the grind. I think EVE will significantly change in November. The updates page for fall already has a lot of new and revamped features. With the introduction of the Alpha and Omega clone states, I have the feeling more change will hit Tranquility in what we now know is an expansion. I want to try to get some last tasks completed before CCP turns the universe upside-down. Right now, I think I will succeed. With the announcement of EVE Online introducing a version of an extended trial on Wednesday, I feel confident about making one prediction. In November, get ready to deal with a new wave of botters and RMTers. Events like the introduction of clone states are guaranteed those who want to make a quick buck. With that pleasant thought, I decided to look at the preliminary ISK sales numbers I pulled from the publicly posted buyer reviews from Player Auctions. I won't have final numbers until 1 October, but the price numbers shouldn't vary much from the ones gathered so far. CCP is busy making sure the November update is worthy of an expansion name. Monday's news of a revamp of the fleet boosting system was dwarfed yesterday by the news of the implementation of a freemium business model. Before proceeding, please watch the video above and read the dev blog describing the plan in its current state at a high level. After that, my first thoughts on the feature may make more sense.